I’ve always been intrigued by the notion of having my cake and eating it too. Why not a process with direction instead of one or the other? It might sound like an exercise in semantics, but I prefer to use the word “aim” rather than goal. A goal implies a fixed target. Aiming in a direction fits better with a process viewpoint. It allows for shifting as conditions change because I’m not tied to a particular outcome. What am I aiming for? Do I know what I want? I heard an interview this week that prompted me to think about all this. A doctor described how he helps patients clarify what they really want before starting a treatment program. His example was a woman who wanted to lose a large amount of weight. Doctor: Do you really want to lose weight? Doctor: Really? I could amputate your leg and you would lose a fair bit of weight. Is that what you want? This ridiculous-sounding exchange points out the need to be clear about what we’re aiming for. When I was 60 pounds overweight after the removal of my thyroid, I never thought of recovery as being about weight loss. I always said I wanted to normalize the way my body functioned. Now that my body has normalized to a significant degree, I’ve begun thinking in terms of fine-tuning. My current aim is to optimize function instead of simply normalizing it. This seems possible now. Ten years ago, not so much. But isn’t it good enough to be functioning normally, especially at my age? That depends on what I’m aiming for, doesn’t it? 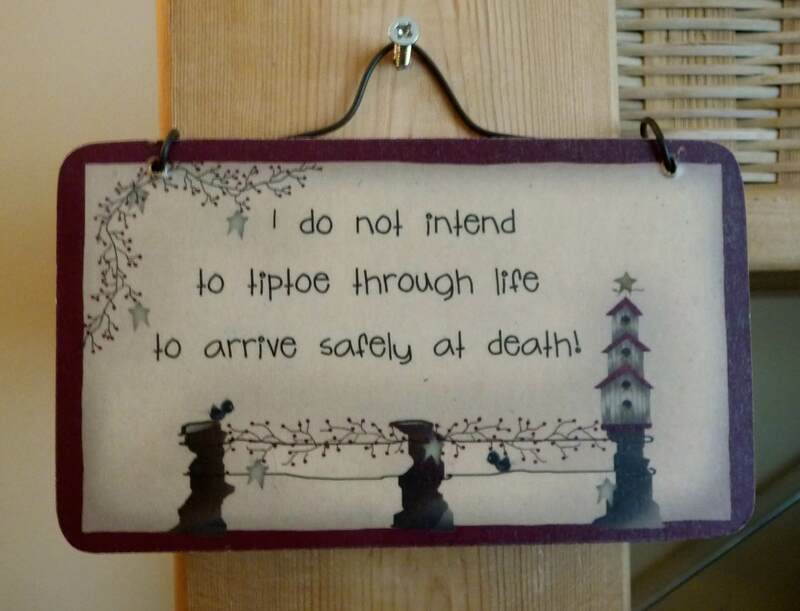 I bought this wall plaque while on a retreat in Maine a few years ago, and it has hung in my office ever since. I need a finely tuned body-mind system in order to live fully. That is why I bother. What’s your “why bother”? What keeps you going when progress is inch by inch? Share your thoughts in the comment box below. This entry was posted in Mindset, Viewpoints & Thinking for Ourselves, Things to Think About, All Posts—newest first and tagged goals, process thinking, life direction, why bother?, motivation by Laurana Rayne. Bookmark the permalink.